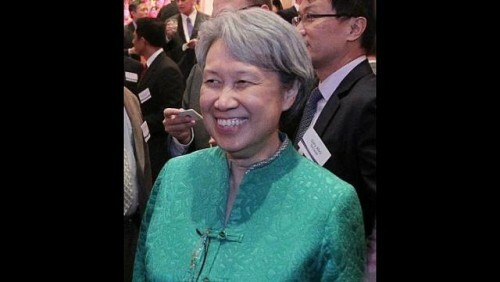 TEMASEK Holdings chief executive Ho Ching has won the Asian Business Leaders Award this year. London-based business think-tank Asia House, a non-profit organisation that aims to foster closer ties between Asia and Europe, said it selected Ms Ho because of her business credentials and her efforts to inspire a commitment in others to improving society. Previous winners include Mr Jack Ma, founder of Chinese e-commerce giant Alibaba, former Tata Group chairman Ratan Tata and former Shell India chairman Vikram Singh Mehta. Asia House chairman John Boyd said in a statement: "We are extremely pleased to honour a business leader of the stature of Ho Ching, who has brought so much renown to Temasek and her industry in Asia. "Ms Ho has demonstrated deeply impressive achievements in business while maintaining a dedication to the highest standards in corporate governance, transparency and leadership." Ms Ho, who is the wife of Prime Minister Lee Hsien Loong, said she was surprised to win the award and that it is a special recognition for Temasek. "I'm privileged to accept this award on behalf of the Temasek team, who are committed to the ideals of being a responsible long-term investor and steward, combining the discipline of being an active investor looking for sustainable long-term returns, and the responsibility of being a trusted steward for past, present and future generations," she added. Ms Ho will receive the award in October. Temasek, which had a $215 billion portfolio as at March 31 last year, is expected to release its latest financial results soon.